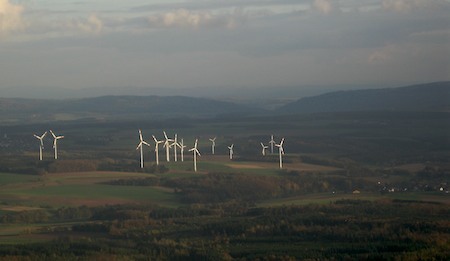 The evening sun caught these wind turbines on Friday, just as we were descending into Frankfurth-Hahn airport. I know some people consider them a blot on the landscape, but I’ve always thought them rather majestic. I find these windmills to add to landscapes rather than detract. Also from a pragmatic point of view rather a bunch of these, than one smelly coal fired power station (OK I mean a LOT of windmills to 1 station!). Would I want one in my back yard – absolutely yes. I wonder what they would look like in olive green rather than the ubiquitious white? Maybe with a little ivy growing up them.